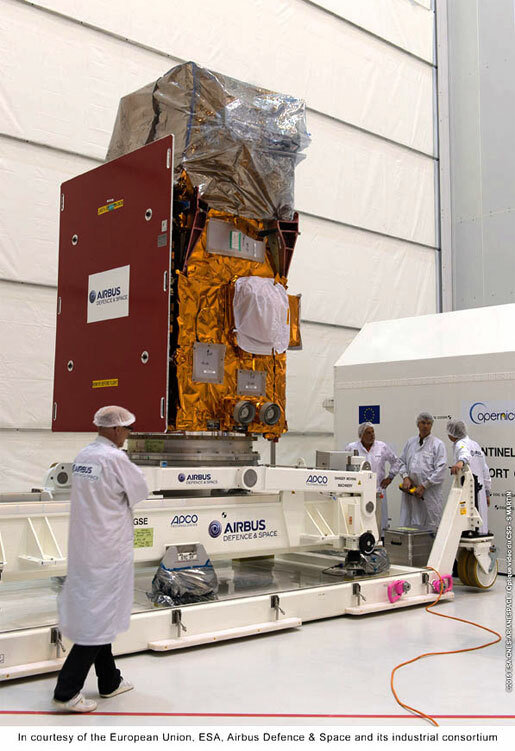 The latest in Europe’s series of Sentinel Earth observation satellites landed at French Guiana today in preparation for its orbiting on an Arianespace Vega vehicle during June, while build-up of the lightweight launcher was initiated at the Spaceport this week. Sentinel-2A was delivered by a chartered Antonov An-124 cargo jetliner that touched down at Cayenne’s Félix Eboué Airport, where the spacecraft’s protective shipping container was unloaded along with support equipment for transfer by road to the Spaceport. To be orbited on Arianespace’s Flight VV05, this 1,140-kg. satellite will deliver high-resolution optical images from around the globe – becoming part of Europe’s Copernicus initiative that is headed by the European Commission in partnership with the European Space Agency. Copernicus is one of the most ambitious Earth observation programs to date, established to provide accurate, timely and easily-accessible information for improved management of the environment, to better understand and mitigate the effects of climate change, as well as to ensure civil security. Airbus Defence and Space is the Sentinel-2A prime contractor, with the satellite designed to supply optical images ranging from the near-visible to the shortwave infrared regions of the electromagnetic spectrum. 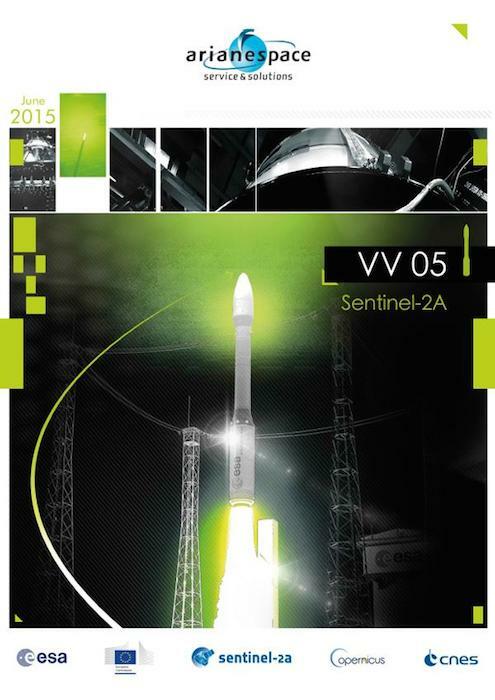 Sentinel-2A’s launch is targeted for June 11 on the fifth flight of a Vega from the Spaceport. The satellite will join Sentinel-1A, orbited in April 2014 by an Arianespace medium-lift Soyuz vehicle, and which carries an advanced radar instrument for all-weather, day-and-night imaging of the Earth’s surface. 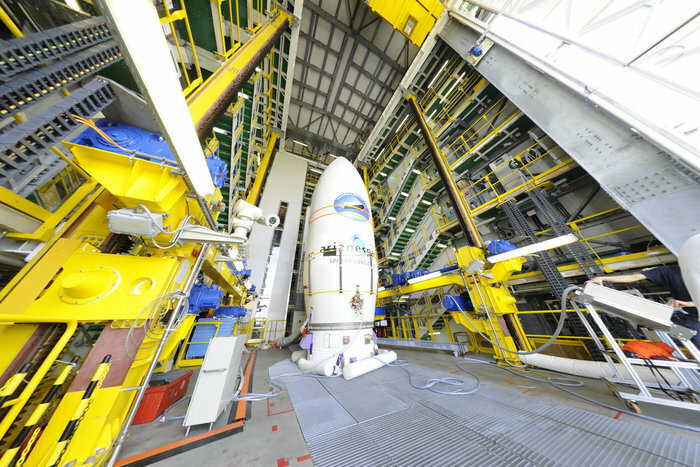 Assembly of the Vega for Arianespace’s Flight VV05 with Sentinel-2A was initiated at the Spaceport this week, as the vehicle’s first stage was rolled out to the launch zone. The first stage is powered by a P80 advanced solid propellant motor, and has now been positioned on the pad at the Spaceport’s ZLV launch site – initiating the vertical build-up process for Vega. 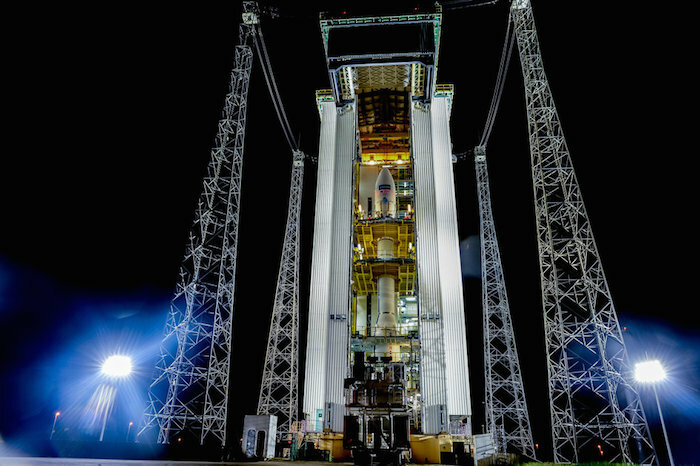 The Sentinel-2A satellite on Arianespace’s next Vega mission is being readied for pre-launch checkout at the Spaceport, which will enable this European Earth observation platform to be orbited in June from French Guiana. Sentinel-2A is positioned in the Spaceport’s S5 payload processing facility for preparation ahead of its scheduled June launch on Vega. During activity in the Spaceport’s S5 payload processing facility, Sentinel-2A was removed from the shipping container that protected this 1,140-kg.-class spacecraft during its airlift from Europe to the South American launch site. 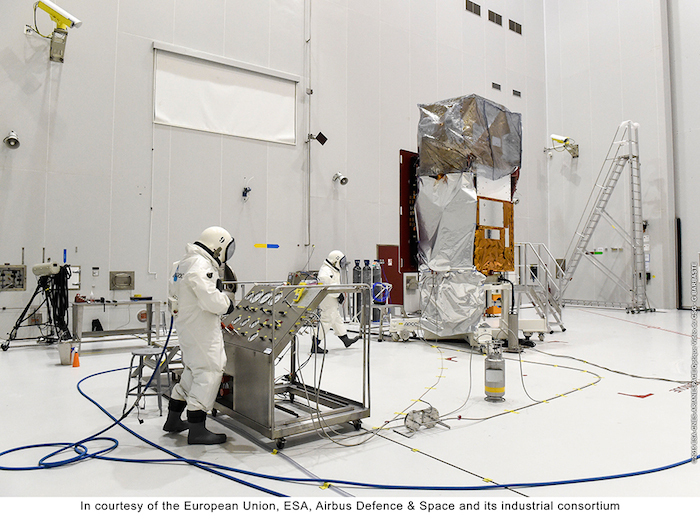 With Sentinel-2A now connected to its ground support equipment and successfully switched on, the satellite will undergo verifications and final preparations for a scheduled June 11 liftoff. The mission with Sentinal-2A is designated Flight VV05, signifying the fifth launch of the lightweight Vega vehicle – which has joined Arianespace’s medium-lift Soyuz and heavyweight Ariane 5 for a complete launcher family to orbit commercial, governmental, institutional, scientific and experimental payloads. Sentinal-2A is the latest in Europe’s series of Earth observation satellites for the Copernicus initiative, which is headed by the European Commission in partnership with the European Space Agency. With its “color vision,” Sentinel-2A is to deliver high-resolution and multispectral capabilities – offering a 290 km.-wide coverage path and frequent revisits. By generating views of Earth’s vegetation and changing landscape in unprecedented detail and accuracy, Sentinal-2A will provide information for agricultural and forestry, as well as help to manage food security. Its images of such Earth activity as floods, volcanic eruptions and landslides are to assist in disaster mapping and help humanitarian relief efforts. Airbus Defence and Space is Sentinel-2A’s prime contractor. The satellite will join Sentinel-1A, orbited by Arianespace in April 2014 on a Soyuz launcher, and which carries an advanced radar instrument for all-weather, day-and-night imaging of the Earth’s surface. 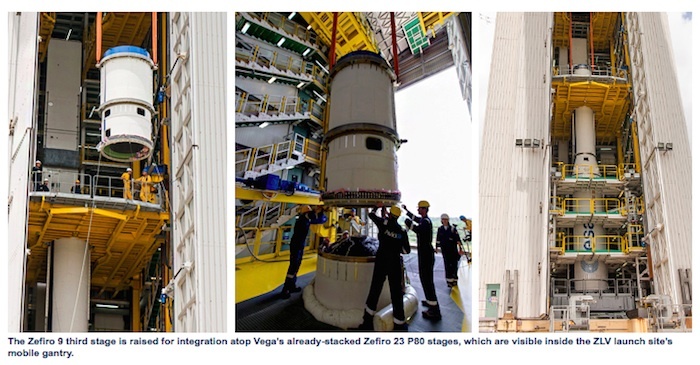 During activity at the Spaceport’s ZLV launch site, Vega’s Zefiro 23 solid propellant second stage has now been integrated atop the vehicle’s P80 first stage, which also uses solid propellant. This vertical assembly process is underway inside the launch pad’s mobile gantry, and will be followed by installation of Vega’s solid-propellant Zefiro 9 third stage and a top-off with the bi-propellant liquid upper stage called AVUM (Attitude and Vernier Upper Module). The four-stage Vega was conceived as a capable lightweight launcher that complements Arianespace’s other two launch vehicles: the medium-lift Soyuz and heavyweight Ariane 5, creating a complete family. Vega is tailored to orbit small- to medium-sized satellites, including institutional and scientific spacecraft. Its development was performed in a European program led by Italy’s ASI space agency and industrial prime contractor ELV SpA. The Sentinel-2A payload to be lofted by Vega this summer is the latest in Europe’s series of Earth observation satellites for the Copernicus initiative, headed by the European Commission in partnership with the European Space Agency. With its “color vision,” the 1,140-kg.-class Sentinel-2A spacecraft will deliver high-resolution and multispectral capabilities – providing a 290 km.-wide coverage path and frequent revisits. Sentinel-2A was built by prime contractor Airbus Defence and Space. It will join Sentinel-1A, which carries an advanced radar instrument for all-weather, day-and-night imaging of the Earth’s surface and was orbited by Arianespace in April 2014 on a Soyuz launcher. For Vega’s upcoming mission, the launch is designated Flight VV05 in Arianespace’s numbering system. It follows Vega launches performed last February (Flight VV04, using a suborbital trajectory to evaluate the European Intermediate eXperimental Vehicle spaceplane demonstrator); in April 2014 (Flight VV03, with Kazakhstan’s KazEOSat-1/DZZ-HR Earth observation satellite); Flight VV02 in May 2013 (orbiting the Proba-V, VNREDSat-1 and ESTCube-1 spacecraft); and Flight VV01 in February 2012 (with the LARES and ALMASat-1 payloads, accompanied by multiple cubesats). A zoom-in view (at top) details Vega’s Zefiro 23 solid propellant second stage during transfer, while a wider angle photo (at bottom) shows it approaching the Spaceport’s ZLV launch site. Silver-colored thermal protection is removed from the stage once inside the launch site’s mobile gantry. 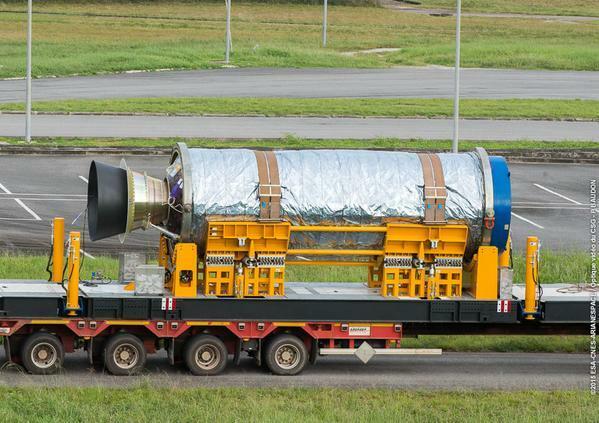 The “stacking” of Vega’s solid propellant propulsion systems is complete with integration of its Zefiro 9 third stage at the Spaceport in French Guiana. This activity took place at the Spaceport’s ZLV launch site inside a protective mobile gantry, where the Zefiro 9 was placed atop Vega’s two other solid propellant stages: the Zefiro 23 second stage and the P80 first stage. The next step will be Vega’s “top off” with its bi-propellant liquid upper stage, called the AVUM (Attitude and Vernier Upper Module). Vega’s summer mission will loft the Sentinel-2A payload, which is the latest in Europe’s series of Earth observation satellites for the Copernicus initiative – led by the European Commission in partnership with the European Space Agency. The goal of Copernicus is to provide accurate, timely and easily-accessible information for improving management of the environment, as well as understanding and mitigating climate change effects, while also contributing to civil security. The 1,140-kg.-class Sentinel-2A spacecraft is well suited for Arianespace’s lightweight Vega, which was conceived as a capable lightweight launcher in the company’s complete family – complementing its other two vehicles: the medium-lift Soyuz and heavyweight Ariane 5. Vega’s development was performed in a European program led by Italy’s ASI space agency and industrial prime contractor ELV SpA. 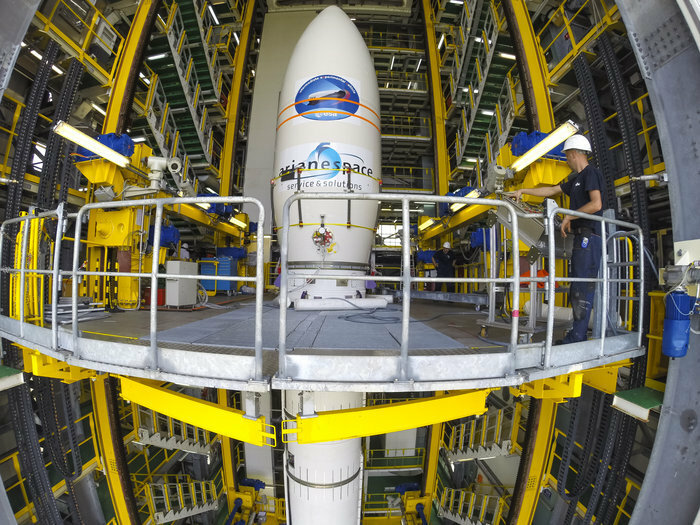 The Sentinel-2A satellite has been fueled at the Spaceport as preparations continue for its launch on Arianespace’s next Vega mission, which is scheduled for liftoff from French Guiana on June 22. Built by Airbus Defence and Space as prime contractor, the spacecraft received its propellant load this week in the S5A fueling and integration hall – with the activity coming after Sentinel-2A’s pre-launch checkout process. The upcoming mission is designated Flight VV05, signifying the fifth launch of the lightweight Vega vehicle – which has joined Arianespace’s medium-lift Soyuz and heavyweight Ariane 5 for a complete launcher family to orbit commercial, governmental, institutional, scientific and experimental payloads. Vega’s development was performed in a European program led by Italy’s ASI space agency and industrial prime contractor ELV SpA. 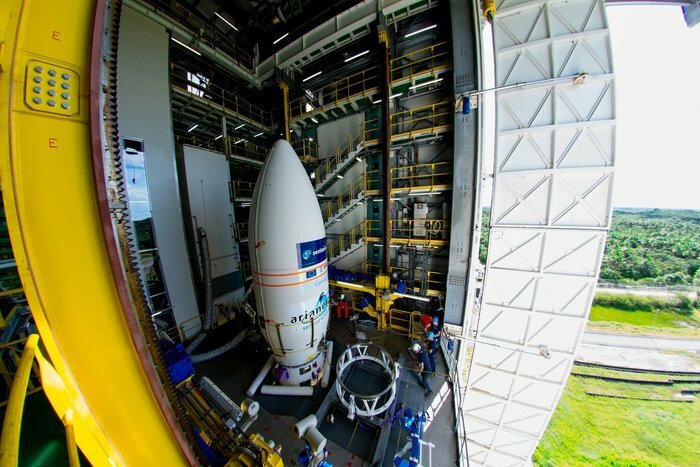 Flight VV05 also will mark Arianespace’s fifth mission this year using a member of its launcher family, underscoring the company’s sustained operational pace at the Spaceport in 2015. It follows two previous flights for Ariane 5, plus one each with Soyuz and Vega. Sentinel-2A is the latest Earth observation satellite for Europe’s ambitious Copernicus initiative, which is headed by the European Commission in partnership with the European Space Agency. Copernicus’ goal is to provide accurate, timely and easily-accessible information for improving management of the environment, as well as understanding and mitigating climate change effects, while also contributing to civil security. The 1,140-kg.-class Sentinel-2A will deliver high-resolution and multispectral capabilities, providing a 290 km.-wide coverage path and frequent revisits; and is to join the Sentinel-1A spacecraft orbited by an Arianespace Soyuz mission in April 2014. With less than a week to liftoff, the next Sentinel satellite for the Copernicus environmental monitoring programme is now in position high up in the launch tower at Europe’s Spaceport in Kourou, French Guiana. The Vega rocket’s upper stage is now being fuelled. On Friday there will be a full rehearsal involving Arianespace, the Sentinel-2 team in Kourou and ESA’s European Space Operations Centre in Germany in preparation for liftoff, set for 23 June at 01:52 GMT (03:52 CEST; 22:52 local time on 22 June). 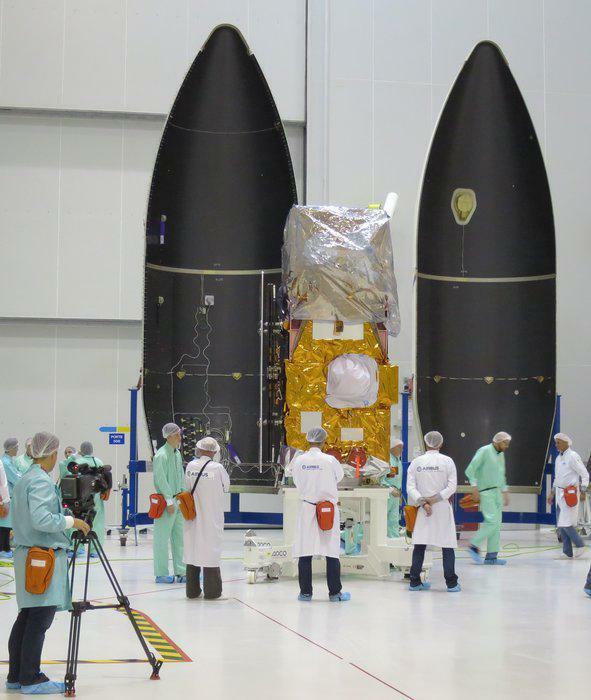 After eight years in the making, the satellite arrived at the site at the end of April where it has been tested and encapsulated in the Vega fairing. Paolo Laberinti, ESA’s Sentinel-2A Launch Campaign Manager, explained, “We first verified the full health of the satellite after shipping, including testing the ‘light tightness’ of the multispectral instrument and checking the alignment of its optical references, which is very important to ensure the mission provides the high-quality imagery in the many nuances of colour needed to monitor Earth’s vegetation accurately. “We also completed the hazardous task of filling the satellite with propellant and then pressurising the tank. “This was the last of our key events before starting the ‘combined operations plan’, which is carried out with the Arianespace launch team. This included placing the satellite in the rocket fairing that will protect our baby on its journey into space. “Now that this assembly has been transferred to the top of the Vega rocket in the gantry, we have already started final checks and have not had any problems powering up the satellite to establish control. “The cooperation between ESA and Airbus Defence and Space, who led the mission development, has been fantastic and we are all very proud of how far we’ve come. François Spoto, ESA’s Sentinel-2 Project Manager, added, “After raising our first ‘Sentinel-2 child’ for eight years we have now entrusted it to Arianespace. Once operational, the mission will provide information for agriculture and forestry and for helping to manage food security. Satellite images will be used to determine various plant features such as leaf chlorophyll and water content. This is particularly important for effectively predicting crop yields and other vegetation applications. As well as monitoring plant growth, Sentinel-2 will be used to map changes in land cover and to monitor the world’s forests. It will also provide information on pollution in lakes and coastal waters. Images of floods, volcanic eruptions and landslides will contribute to disaster mapping and helping humanitarian relief efforts. 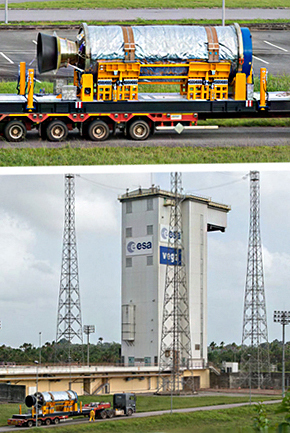 THE LAUNCH READINESS REVIEW (RAL) took place in Kourou on Friday June 19, 2015 and authorized count-down operations for the Vega - Sentinel-2A launch. On the fifth launch of the year from the Guiana Space center in French Guiana, and the fifth with Vega, Arianespace will orbit Sentinel-2A, on behalf of the European Commission within the scope of a contract with the European Space Agency (ESA). It will be launched from the Vega launch complex (SLV), in Kourou, French Guiana.